The dealer tries to sell you a car that has previously been wrecked, only they tell you it's in great shape, or lie about the wreck, or in some cases, they were honestly unaware the car was wrecked. 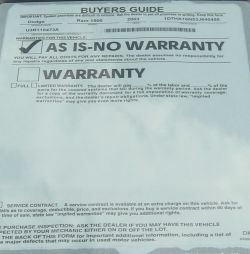 The car has the federally required Buyers Guide sticker with the words "As Is, No Warranty" on it. This means you are buying a used car and assuming all risks. You can't return the car because you agreed to accept any damages. We sometimes hear from car buyers who were not given this guide as required by Federal law. Even "Certified Used Cars" can be previous wrecks, as we were surprised to find once after running the VIN on a certified used Lexus. We get emails all the time from people who believe the dealer when they are told the car was never wrecked, then they find out a few weeks later when they bring it in for service, or they run an AutoCheck Report showing that it was wrecked. When they return to confront the dealer, they are quickly reminded that they signed "As Is" paperwork. The scammed customer has no recourse, because they can't prove anything. The "As Is" paper is the only protection the dealer needs. You however, have nothing to fall back on. Never ever buy a used car from a dealer "As Is" with no warranty. When buying a used car from a private party, you have no choice, it's "As Is." When buying a used car from a dealers, always try to get a minimum of a 30 day warranty. If the car is truly the cream puff they say it is, let them back up the talk with a 3 month warranty in writing, otherwise the dealer is just blowing hot air. There are 2 step the you must take before buying any used car (certified cars included). First, you must run your own AutoCheck Report vehicle history report on the used car (don't trust the one the dealer might have given you). Secondly, get the car inspected, on a lift, by a certified mechanic. That's how we found that a Lexus dealer's Certified Used Lexus had been in a wreck. Many people fail to perform these crucial 2 steps. If you don't do these steps, then don't buy the car.